A word about community theater. I am about as big of a Broadway snob as they come. (I'm sorry, it's true.) But even I make a point to see all kinds of productions, from Off-Broadway to Fringe to local productions of both established works and originals. Sometimes it's because I know the people putting on the production, sometimes it's because I love the show, and sometimes it's just to support local theater. My favorite community theater moments have been when I am delivered a huge dose of humility about my Broadway-centered-ness. Nothing is better than a killer production with local talent that exceeds your every expectation. Luckily for me and my community, that has happened twice in the past month. 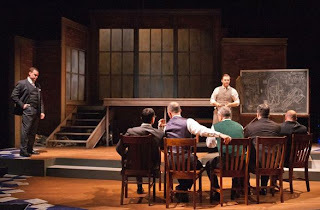 Forward Theater Company's The Farnsworth Invention was a masterpiece. The intricacy of Aaron Sorkin's language and the depth of plot detail would have stumped almost any other group of actors and creative staff, but this incredible ensemble staged a gripping, intelligent, moving piece of theater. I was enthralled and left in a state which is incredibly rare for me: speechless. Four Seasons Theatre's RENT was the regional theater premiere of Jonathan Larson's bohemian rock opera. It is a personal favorite of mine - a staple in my all-time top three musicals - and this particular production was honestly one of the best I've ever seen. This cast was awe-inspiring, their habitation of their characters so complete I forgot the familiar faces and simply fell into their story. I can't stop thinking about how excellent it was, and I can rarely say that - even about Broadway shows.